Unveiled at MWC 2012, the Asus Padfone has a 4.3-inch display – Super AMOLEDqHD quality – is powered by a Qualcomm Snapdragon S4 dual core processor and there's an 8MP camera on-board, including by some Fujifilm technology. The device uses Android 4.0 and expands into a 10.1-inch tablet when you dock it into the Padfone Station. Once docked, the battery power is multiplied by five. 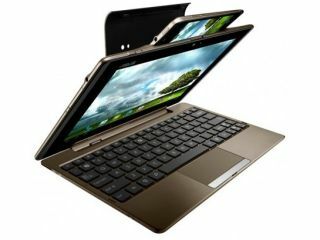 If you don't fancy transforming the Padfone into a tablet, then it can also be a netbook. All you need for this is an optional keyboard dock and the Padfone Station. Plug this in and you essentially have a netbook, or a UMPC depending on which way you swing when it comes to computing technology. And if that wasn't enough, there's also a Bluetooth stylus for the Padfone, which also a headset. Yes, a headset – we would prefer it to turn into a robot but you can't have everything. The Asus Padfone UK release date is April, with pricing to be announced.